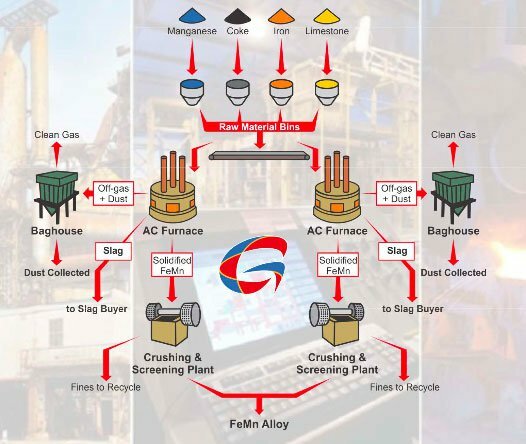 Gulf Minerals Corporation Ltd (ASX:GMC) has secured US$20M in funding to bring its Indonesian ferromanganese alloy smelting project into production and plans to list its subsidiary, International Manganese Group Limited, which holds the Indonesian smelter operation, on the Singapore Stock Exchange’s Catalist Board. GMC is building a $52M smelting facility on the island of West Timor to produce 80% manganese (Mn) alloy from low impurity Indonesian manganese ore for costs reckoned at 80% of industry average. Manganese alloy is an in-demand metal from global steel manufacturers, and by 2018 GMC plans to produce 144,000tpa from its West Timor operation. Currently capped at around $3M, GMC will export and sell its manganese alloy to customers in ASEAN (Association of Southeast Asian Nations) free trade region and overseas markets such as the Middle East and Europe. By operating in Indonesia, GMC is taking advantage of a five year ‘tax holiday’ for new international investment, and aims to make the smelter a regional hub for manganese alloy production. It is understood that the company enjoys a strong working relationship with Indonesia’s government and is progressively working through the project’s legal, environmental and infrastructure needs. Site works are set to begin in July, and GMC is pursuing a funding strategy combining equity, debt and future cash flow to bring its West Timor smelter into its first stage of production by 2016. GMC has just entered into a term sheet covering a committed equity funding agreement of US$20M with Sigur Holdings Inc, a subsidiary of Sigur Group, a private South African investment group. Sigur will provide GMC with US$20M in total funding – by way of 10% annual interest, a four year senior credit facility loan and preferred shares. Full details on the terms of the funding can be read here. A senior representative of the company will also join GMC’s board. 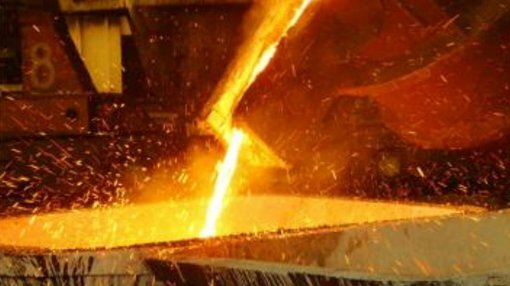 The proposed funding deal will cover the first stage of development of the Indonesian smelter enterprise that will be built over four stages until 2018 for a total cost of $52M. GMC also plans to spin off 56% of its subsidiary, International Manganese Group Limited, which holds the Indonesian smelter operation, onto the Singapore Stock Exchange Catalist Board. Funds generated from a future IPO could then go towards covering the remaining construction costs. GMC’s Chairman, Graham Anderson, commented: “This achievement is a watershed moment in the company’s development of the manganese enterprise and is the culmination of the past 12 months of focused effort by the directors and senior management,” he says. The funding agreement comes after GMC raised just over $1.3M in an entitlement rights issue to shareholders. These developments mean GMC should go into the construction phase of its manganese alloy enterprise with adequate funds to see it through. The market for manganese alloy is dominated by the needs of steel manufacturers, which use the material as a hardener. Manganese alloys are the fourth most used metal after iron, aluminium and copper, and can also be used in dry cell batteries. 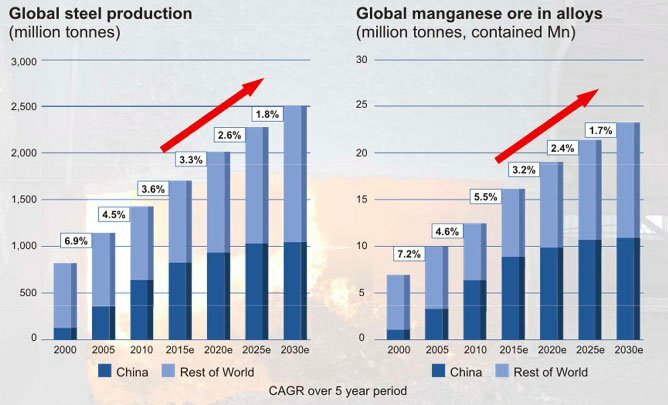 As global steel demand continues to see increases, so too does the demand for manganese alloys, providing an opportunity for GMC to bring a new source of this valuable material on stream into a strong market. When GMC begins first production in 2016, the company anticipates it will be able to sell its material quickly, setting up cash flow that can pay for additional development. GMC’s manganese alloy smelting operation is located near the city of Kupang, the capital of West Timor, which has a highly skilled yet low cost work force. GMC has been granted a 50 year lease over a 30 hectare block in the Bolok industrial area, 10km from the city and five kilometres from the export port of Tenau. The smelting facility is being built from modular components manufactured in South Africa and progressively set up as the project enters production. Como Engineers has been selected by GMC as the project manager for the facility’s construction, with XRAM Technologies Pty Ltd nominated as the pyrometallurgical engineers. Major site works are set to begin in the 3rd quarter of 2015, with first production expected one year later. The initial production rate will be 32,000t of alloy and over the four years of expansion this rate is set to rise to 144,000tpa with eight smelters running. The Kupang facility’s fixed semi-closed smelters will release metal from ore to produce alloy. The ores will be sourced from mining operations in West Timor and across the Indonesian archipelago, as well as other foreign sources. Indonesian ore is noted for its low impurities and has a make up of 52% Mn and 2% Fe. GMC’s smelters will covert this 52% ore into 80% manganese alloy using a blasting and refining process. It will also produce 12% iron, 7.5% carbon and 1% silicon. 260,000t of Indonesian ore and 100,000t of imported ore will cover the smelting facilities ore requirements at maximum capacity. The use of fixed semi-closed high temperature furnaces is a tried and true method, and the power to run them will be supplied by a third party on a user pays basis. Each smelter will cost GMC $5.6M and has a capacity of 20,000t of alloy a year. The company is focussed on installing the first two smelters at the facility and bringing them online, using the cash flow to support the installation of six more over a four year period. The US$20M in funding from Sigur Holdings will support this initial period of construction, and GMC is working closely with local and national governments to fast track the development. By choosing to set up its smelting operation in Indonesia, GMC is taking advantage of many favourable elements, including the low impurity manganese ore it can source for its facility. The nation is a founding member of the ASEAN free trade area and a member of the G20, so its economy is seen as stable and able to grow. Indonesia offers a five year tax holiday for international investment and developments, greatly easing the burden for GMC as it seeks to bring its Kupang facility into production by 2016. The government is also committed to issuing a production license to GMC within three months of its application, under a decree by President Joko Widodo for a ‘one stop shop’ combining the approval of 22 government ministries into one process. GMC’s Executive Chairman, Graham Anderson, says the Indonesian government is removing as many bottlenecks as it can to get the Kupang facility up and running. “The new presidential decree to fast track government dealings into one ministry with a ‘can do’ approach is like a breath of fresh air and will certainly facilitate much quicker approvals for projects,” he says. GMC executives have recently held high-level meetings with Indonesian officials including the Deputy Minister for Commerce and Entrepreneurship, the Governor of Nusa Tenggara Timur (West Timor) and the Deputy Director for Mineral Resources. On the back of these meetings, GMC has secured several key agreements. The company has been granted a 50 year lease on a block of land at Kupang; an assurance that power company PLN can supply electricity to the facility for the first stage of development on a per unit basis; and an environmental approval process that should take less than two months. Subsequent power will be supplied by a stand-alone coal fired power plant operated by an infrastructure group. 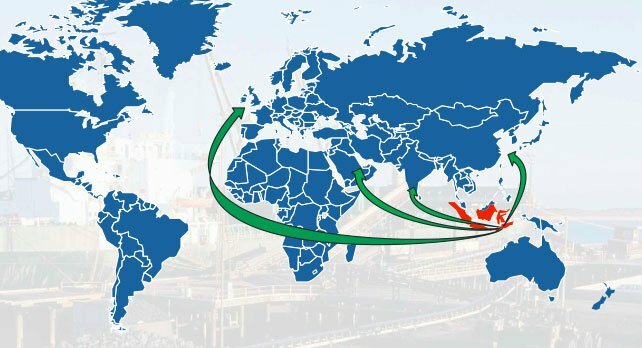 GMC’s wider goal is to create a manganese alloy hub for the Asian region, and its strategic location in Indonesia means it can export high grade material to a wide array of nations within its regional grasp.